US earnings data was able to trump the economic figures once again last night. However, this time, it was to the benefit of the Dow Jones, with the index moving 41 points higher to 16,015 and resuming its February rally. The surprising 0.4% drop in retail sales numbers seemed to be offset by the corporate optimism. Nevertheless, European indices are set to open fairly mixed this morning as traders turn cautious. Despite the run up in stock markets over the last few days, the signals from the real economy seem to suggest that there is a dislocation between the two. Following on from the weak US retail sales, the overnight session saw some subdued Chinese inflation data pointing towards weaker domestic demand. The macro environment is set to get even murkier as today's release of Eurozone Q4 GDP data is expected to see an anaemic 0.2%. With such negative headwinds hanging over the markets, traders will be rightly questioning whether the current levels are justified. A stellar run over the last few days has seen the buyers run out of steam and those of a shorter-term nature will be looking to book profits. Despite the modest pull back, bulls should still be feeling fairly confident what with members of the ECB, BoE and Fed all coming out with dovish comments this week, keeping one of the main pillars of the rally well underpinned. Following yesterday's comments from the ECB's Coeure that negative deposit rates were a real possibility, traders will be looking to today's ECB monthly bulletin to step up the dovishness a notch from the usual 'accommodative stance of monetary policy for as long as necessary'. The renewed optimism regarding the US economic growth was overshadowed yesterday by some disappointing corporate earnings especially coming from brand names like Procter & Gamble and Amazon. It was enough to keep the Dow Jones at arms' length, closing a mere 7 points down at 15,973. As widely expected, Federal Reserve Chairman Janet Yellen gave global markets exactly what they wanted to hear, consistency. That was enough to convince investors the US economy is in a strong enough shape to sustain further tapering in 'measured steps'. So, it was little surprise to see the Dow Jones resuming its rally, with the index gaining 180 points to 15,979.5. Janet Yellen, the newly appointed Federal Reserve Chairman is due to deliver her first speech on monetary policy later today. As a result, US investors were on standby yesterday, with the Dow Jones closing rather flat around the 15,800 mark. Despite the lack of direction, we did see an overnight rally on expectations that Yellen will not want to spook the global markets. These gains are set to see European equities creep higher and, with little else of note on the economic calendar, traders will have nothing to do but consider what she is going to say. Although she is known for her staunch dovish support for ultra easy monetary policy, it seems unlikely that she will scale back the Fed's tapering program as some are speculating. However, bulls may still get rewarded with a shifting of the threshold for an interest rate hike. The rapid decline in the unemployment rate now sees it hovering at 6.6%, just above the Fed's current target level of 6.5%. However, the main reason for this is that people have been dropping out of the labour force, so bulls will be looking for some sort of 're-phrasing' or lowering of the threshold to bring it more into line with the real economy. Friday was a particularly odd day for market logic. First, the German Constitutional Court suggested that the ECB's OMT was illegal but passed the buck to the European Court of Justice. Then the Non-Farm Payrolls came in nowhere near economists' expectations and the unemployment rate edged towards the level where the FOMC may consider monetary tightening. Even the issue of an emerging market rout looks to be pass� now and what is actually fuelling this upward move is unclear as positive cues look to be very thin on the ground. There was some technical support around the lows made in mid-December and the suddenness of the turn around in sentiment caught some shorts the wrong way round, but news wires seemed to be void of bullish stories. Perhaps markets are taking comfort in the fact that uber dove Janet Yellen is making her first outing as Fed Chair? The NFP data indicated a weaker than estimated 113,000 jobs rise, with the unemployment rate falling to 6.6%, the lowest level in more than 5 years. 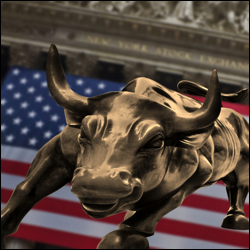 Despite that, the Dow Jones rallied steadily throughout the day, gaining 182 points to 15,796. It seemed that market participants took the disappointment with a pinch of salt as it wasn't weak enough to spark fears of a u-turn regarding the stimulus cuts.